For creating an everyday look you can take a brown and white striped suit with a long double breasted blazer and straight pants and combine it with a classic white t-shirt. Or choose a beige top and mix it with a white and black striped blazer, a necklace, a belt, gray cuffed skinny jeans and red patent leather heeled shoes. Wanna make an outfit for the event? 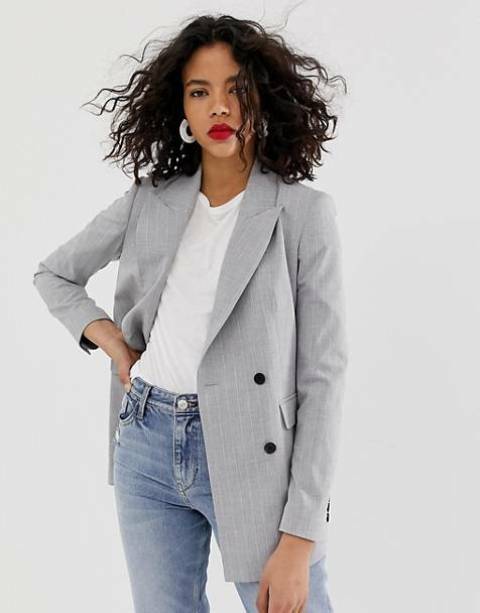 Then take a white long button down shirt and pair it with a pale pink double breasted blazer, a mini clutch, flare cropped trousers and black ankle strap high heels. For hot summer days you can try to repeat a combination with a white shirt, denim shorts, a navy blue blazer and white sneakers. For those who want to create a sporty chic look I offer to pair a black crop top with a black mini skirt, black and white slip on shoes, a burnt orange long blazer and a printed clutch. If you wanna something feminine, then choose a white top and combine it with a black double breasted blazer, a neutral colored pleated midi skirt and yellow high heels.